Own Disney Pixar - Toy Story Chosen One Mug from Deff, DVD, Blu-Ray & 4K Video Specialists - Free UK Delivery..
Before Finding Nemo, Monsters, Inc. and Cars, the creative minds of Disney/Pixar introduced you to Toy Story and an astonishing world where toys play while their owners are away. Rediscover acclaimed filmmaker John Lasseter's directorial debut with Woody (Tom Hanks), Buzz Lightyear (Tim Allen) and all their friends in an adventure filled with humour, heart and friendship - in a must-have Special Edition. This groundbreaking computer-gen..
Own Disney Pixar - Toy Story Vintage Posters Mug from Deff, DVD, Blu-Ray & 4K Video Specialists - Free UK Delivery..
TOY STORY - Before Finding Nemo, Monsters, Inc. and Cars, the creative minds of Disney/Pixar invited you into an astonishing world where toys happily play while their owners are away. Enjoy all the fun and excitement with Woody, Buzz Lightyear and all their friends in a movie that goes to infinity and beyond! TOY STORY 2 - Experience the groundbreaking computer-generated hit that earned a Golden Globe Award for Best Picture. Rediscov..
From the filmmakers behind Finding Nemo, Monsters, Inc. and Cars comes Toy Story 2 - the highly acclaimed hit that earned a Golden Globe Award for Best Picture. Rediscover the humour, heart and friendship of this hilarious adventure in a spectacular new Special Edition that goes to infinity and beyond! Enter Disney/Pixar's incredible new world with Woody, Buzz, Jessie and Bullseye in the movie that shows us what being a toy, and a frien..
From the filmmakers behind Finding Nemo, Cars and Up comes the celebrated comedy, Toy Story 2. Watch your favourite characters jump off the screen as you rediscover the humour, heart and friendship of this hilarious adventure that goes to infinity and beyond in astonishing Disney Blu-ray 3D! Enter Disney and Pixar's incredible new world with Woody, Buzz, Jessie and Bullseye in the movie that shows us what being a toy, and a friend, is a.. The creative minds behind Disney/Pixar's groundbreaking animated blockbusters invite you back inside the toy box for a heartwarming and hilarious Blu-ray 3D experience that takes the story off your screen and into your living room! In Toy Story 3, Woody (voiced by Tom Hanks), Buzz Lightyear (voiced by Tim Allen) and the rest of the Toy Story gang return for an all-new adventure, along with a few new faces - some plastic, some plush - in.. The creative minds behind Disney/Pixar's groundbreaking animated blockbusters invite you back inside the toy box for a heartwarming and hilarious High Definition movie experience you'll never forget. In Toy Story 3, Woody (voiced by Tom Hanks), Buzz Lightyear (voiced by Tim Allen) and the rest of the Toy Story gang return for an all-new adventure, along with a few new faces - some plastic, some plush - including Barbie's counterpart Ken.. Experience a whole new dimension of Toy Story fun as your favourite characters jump off the screen and into your living room in astonishing Disney Blu-ray 3D! 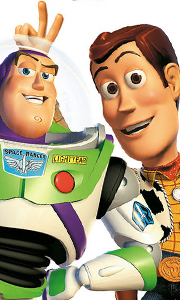 Before Finding Nemo, Monsters, Inc. and Cars, and Up, the creative minds of Disney and Pixar introduced you to Toy Story and an astonishing world where toys play while their owners are away. Rediscover acclaimed filmmaker John Lasseter's directorial debut with Woody (Tom Hanks), B..
Own Disney Pixar - Toy Story Pizza Planet Mug from Deff, DVD, Blu-Ray & 4K Video Specialists - Free UK Delivery..
Own Toy Story - Special Edition DVD from Deff, DVD, Blu-Ray & 4K Video Specialists - Free UK Delivery..
Own Disney Pixar - Toy Story Ultimate Showdown Mug from Deff, DVD, Blu-Ray & 4K Video Specialists - Free UK Delivery.. The creative minds behind Disney/Pixar's groundbreaking animated blockbusters invite you back inside the toy box for a heartwarming and hilarious movie experience you'll never forget. In Toy Story 3, Woody (voiced by Tom Hanks), Buzz Lightyear (voiced by Tim Allen) and the rest of the Toy Story gang return for an all-new adventure, along with a few new faces - some plastic, some plush - including Barbie's counterpart Ken (voiced by Mich..